Pick up almost any issue of a weekly Bay Area paper, and you’d wonder why anyone wants to live in San Francisco. Astronomical rents! Techies taking over the Mission neighborhood! City College on the brink of closure, threatening to dump 90,000 students on the streets! Metered parking on Sunday afternoons, as if it wasn’t already hard enough the rest of the week! The Marin Headlands, as seen looking north from the Point Bonita Lighthouse. From Golden Gate Park, it is indeed just less than an hour to this stunning view. Even many longtime biker-residents, however, remain unaware that Point Bonita Lighthouse is eminently reachable without much strain—on one of the two routes from town, anyway. 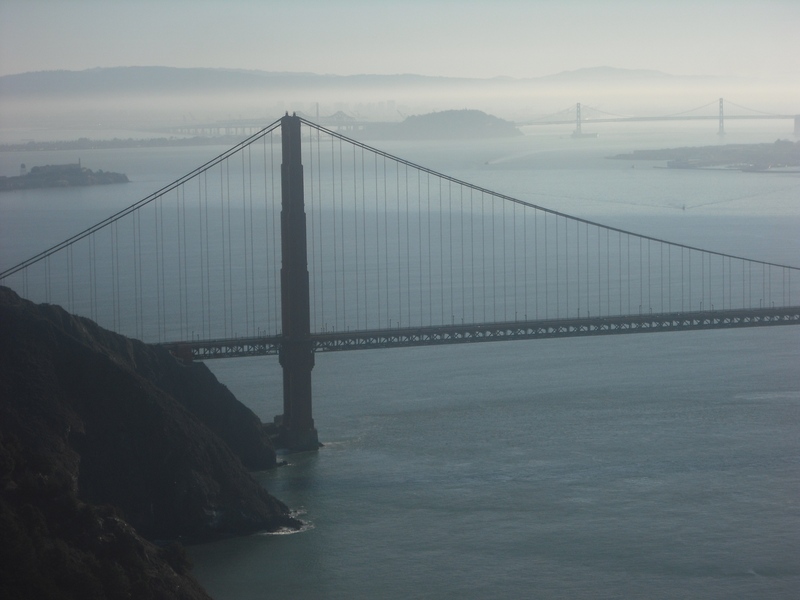 The Marin Headlands, after you survive the steep 15-minute uphill ride the starts from the west side of the Golden Gate bridge. The Golden Gate Bridge, in the foreground; the Bay Bridge, in the background. It’s not far from the summit to the Point Bonita Lighthouse, but the steep (18% at its outset) downhill grade admittedly isn’t for the faint-hearted. If you’re up for the rollercoaster-like dip, make sure your brakes are in good shape. And, as tempting as it might be to look at the stunning coastal views to your left as you descend, keep your eyes on the one-way (in the downhill direction, fortunately) road, at least until it levels out a bit after the first mile or so. As pretty as that cliffside is, you don’t want to tumble over it. As a somewhat easier option, go east (right) instead of west when you cross the bridge, go a couple hundred yards or so downhill, and make the first left to go through the tunnel. It’s still a bit of a white-knuckle ride, as the one-way tunnel traffic goes in different directions depending on the lights, and cars might be coming toward you. There are bike lanes on both sides of the road, however, and once you emerge, you get a couple miles or so of rural-esque scenery. There’s one steep hill just before the lighthouse, though—not as steep (and not nearly as long) as the coastal route, but still enough to knock the breath out of you. You can lock up at a small bike rack at the trailhead to Point Bonita Lighthouse. 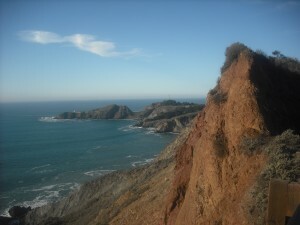 Looking back to San Francisco from the trailhead to the Point Bonita Lighthouse, February 24. 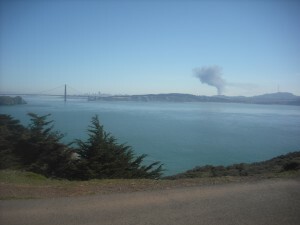 Turns out there was a big fire midday in the Bayview neighborhood of San Francisco, not far north of Candlestick Park. 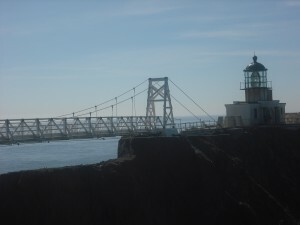 The bridge to Point Bonita Lighthouse. 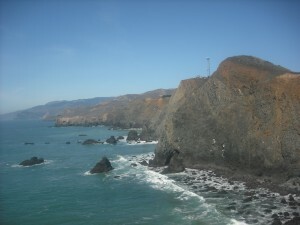 For more information about the Point Bonita Lighthouse, go to http://www.nps.gov/goga/pobo.htm. For more information about biking in San Francisco and the Bay Area, start with the San Francisco Bicycle Coalition, at http://www.sfbike.org.